The FortiGate-100D series is an ideal security solution for small and medium enterprises or remote branch offices of larger networks. It combines firewall, IPSec and SSL VPN, application control, intrusion prevention, anti-malware, antispam, P2P security, and web filtering into a single device. The FortiGate-100D series installs in minutes, automatically downloading regular updates to protect against the latest viruses, network vulnerabilities, worms, spam and phishing attacks, and malicious websites with no administrator intervention. Leveraging patented FortiASIC acceleration, the FortiGate-100D series offers marketleading performance, with high port density that facilitate network growth and expansion. Onboard storage provides local archiving of data for policy compliance and/or WAN Optimization. The WAN Optimization functionality increases network performance by reducing the amount of communication and data transmitted between applications and servers across a WAN, and/or web caching. Consolidated Security Architecture Better protection and lower cost of ownership than multiple point security products. Single Pane of Glass Management Reduces complexity and decreases costs as all security functions can be managed through one console. High Port Density Up to 42 x GbE ports facilitate flexible deployment of network segments and promotes network expansion and high availability configurations. The FortiASIC CP8 content processor works outside of the direct flow of traffic, offloading critical CPU resources. 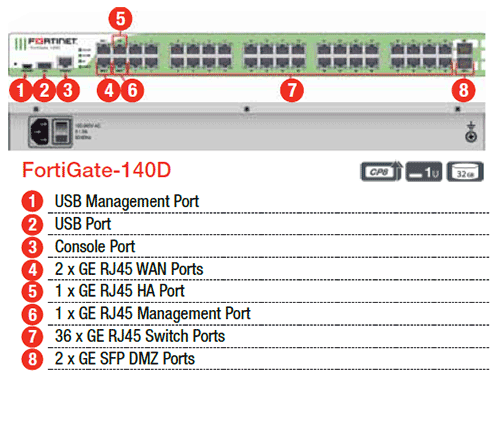 The FortiGate-140D-POE and FortiGate-140D-POE-T1 include PoE interfaces that allow you to plug in compatible wireless access points and IP phones out of the box, providing ease of deployment and lower TCO. Feature Select - Instantly fine-tunes the FortiGate based on desired deployment needs using feature presets. Simplifies user administration and configurations while providing flexibility for different deployment modes. Contextual Visibility - Presents critical deep insights into historic or real-time network activities with data on threat details, IPs, users, devices, applications and more. Allows administrators to quickly understand threats and stop them. Advanced Security - Multiple advanced technologies can be coordinated to look for and stop today's blended, targeted or unknown attacks. Efficient packet handling improves performance while lowering latencies and reducing network complexities. The FortiGate constantly evolves itself in its mission to provide more value for users. Extended features such as WiFi and L2 switch controller, integrated token server, endpoint control and WAN optimization add more security to organizations without incurring additional cost. Fortinet FortiGuard Subscription Services provide automated, real-time, up-to-date protection against the latest security threats. Our threat research labs are located worldwide, providing 24x7 updates when you most need it. Download the Fortinet FortiGate 100D Datasheet (PDF).